We’re celebrating our love of quilting…and ALL OF YOU! We’re excited to announce a fun World Quilting Day Giveaway to honor this special quilting ‘holiday’ and YOU! And YOU have not one, not two, not three, but SIX CHANCES TO WIN fabulous quilting presents! Well actually, you have SEVEN CHANCES TO WIN! 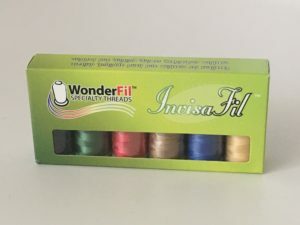 …a collection of Wonderfil InvisaFil thread! This collection, #B003, is a classic collection of colors perfect for many quilting projects. Next up, we’re helping one lucky winner to really enjoy their road trips, with information on local quilt, fabric, sewing and fiber shops you’ll find along the way! 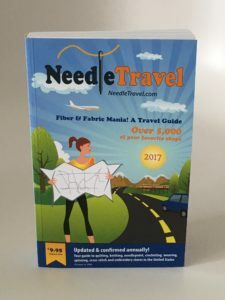 The NeedleTravel guidebook is a perfect companion for your next quilting adventure! And third, a pair of Famore Cutlery EZ Glide Fabric/Batting Shears, the perfect accompaniment to Hobbs batting! 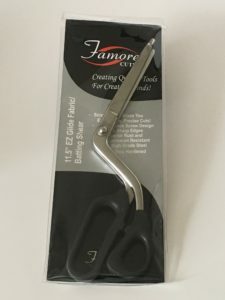 These shears make quick and easy work of cutting your batting and who doesn’t love quick and easy?! The fourth prize that’s up for grabs is this: The Ultimate Guide to Machine Quilting! 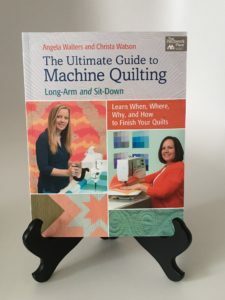 This informative machine-quilting book is by Angela Walters and Christa Watson and is signed by Christa Watson! We know there’ll be some tough competition for this gem! 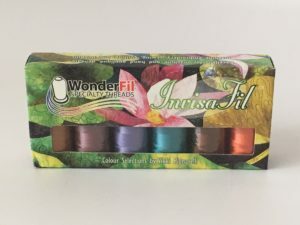 And now for prize number five, a second collection of Wonderfil InvisFil thread! This collection, #B009, is titled “Must Have Mediums” and we think you’ll agree, they’re a must-have! And finally, what would a Hobbs giveaway be without Hobbs batting, right?! 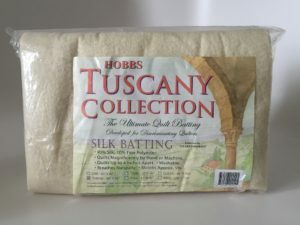 Our sixth and final prize for our first annual World Quilting Day Giveaway is a throw-sized batt of our Tuscany Silk batting! So who’s excited about entering? Yeah, we thought we might see a few (hundred) raised hands! 3. Share this blog post and giveaway (using the social sharing icons below) on one or more social media channels using the hashtags #WorldQuiltingDay, #HobbsBatting and #JoyOfQuilting and you might just be chosen to win our 7th “surprise” prize! We’ll use a random number generator to randomly select six (6) entries from the submitted comments* as our winners. 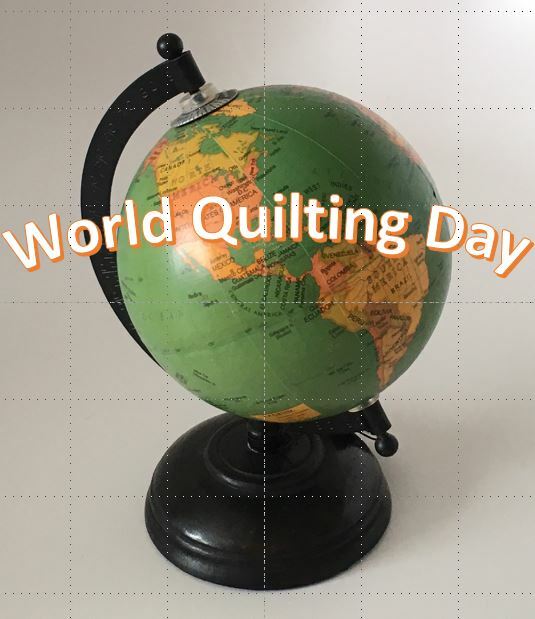 Additionally, we’ll be scouring Facebook, Twitter, Instagram and Pinterest for your share of this giveaway (remember to use the hashtags #WorldQuiltingDay, #HobbsBatting and #JoyOfQuilting so we can spot your shares!) – one social sharer will win a bonus 7th prize! Then, on April 3, 2017, we’ll announce the 6 comment* winners, and one social sharing winner, and each winner will have 72 hours to claim his/her present. Be sure to check back on April 3, 2017 to see if you won! “If I could travel anywhere in the world to learn about quilting and to spend time creating with local quilters, I’d travel to Paducka because Caryl Fallart has her quilting studio / getaway there! I’d travel to the west coast of Canada, for a cruise along the coast to Alaska, to enjoy their amazing beauty. The cruise would be a quilting cruise, of course! I’d travel to Paducah, KY because it is Quilt City USA, full of quilty culture, shops, and the museum. If I could travel anywhere in the world to learn about quilting and to spend time creating with local quilters, I’d travel to Ireland because it’s part of my cultural heritage, and the lack of local quilt shops would have to make them especially creative. If I could travel anywhere in the world to learn about quilting and to spend time with local quilters, I’d travel to Ireland because I could blend my heritage (I’m Irish) with my love of quilting. In addition, the history of quilting is so strong in Great Britain and Ireland that it is something I have always wanted to study. I’d travel to Ireland, because what’s better than sewing with love and being able to trace your family roots all in one trip!!! Great give away, thanks for the chance to win!!! I would love to go to Quilt Market in Missouri, this spring, because I’d love to meet the makers of the quilting industry, and shopping at Missouri Star Quilt Co would be epic! I would go to Germany to meet my Facebook friend, Gabi. She has a quilt shop there. “If I could travel anywhere in the world to learn about quilting and to spend time creating with local quilters, I’d travel to Paducah, Kentucky because I could visit the National Quilt Museum to get ideas and inspiration. I would go to Japan. There are so many beautiful quilts here with exquisite workmanship. That said, I have been to the Paducah quilt shows and Chicago international quilt shows many times, I’m so in awe of the beautiful workmanship by Japanese quilters. They are perfectionists and unique. I am also in awe that they actually are quilting in that far away land. I would travel to Hamilton, MO. because I love Jenni Doan and would love to meet her and go to MSQC! I would travel to Japan, all the quilters are incredible. To learn their hand piecing, applique, and hand quilting techniques. Oh to shop the silks, linens and cottons.